I received my Packet8 'device' today. It's not a router. It is a BPA430 - Broadband Phone Adapter. It just sits anywhere inside your network. 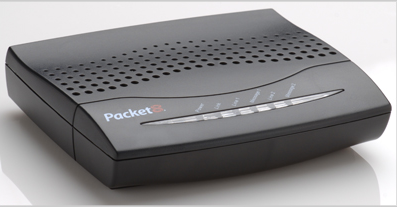 Packet8 is one of the SIP providers that work with the Response Point system. I called support and I was scheduled for a 'telephone support' call tomorrow for the installation. I couldn't wait until tomorrow so i tried on my own. There were a few rough edges when I tried to do this unassisted. Since technical support for new installation wasn't available before tomorrow - I called my friend and RP VAR, Ed Carnes in Nashville. In about 2 minutes Ed had me completely configured and told me how to request an activation number from Packet8. I sent an email off with my request and had the code in a couple minutes. i was up and running. Once you are completely configured - you place an outgoing phone call and the system intercepts your call and instructs you to key in your activation code which I did. Pretty easy. Check out this sound bite - when I tried to make a call - the system actually told me I need to restart my Packet8 device first. Sweet. SOUND BITE Couple of observations - now that I have had a chance to sample several SIP providers. An issue that I found with 4 out of 8 SIP providers that I received responses for when I did a poll of VAR's recently - some services FAIL to forward a call that comes in via SIP and Response Point forwards out via SIP. Packet8 SUCCEEDS on this. Packet8 is willing/able to spoof my caller ID telephone number record. This way I can send my business's published land-line phone number when I make calls out via my SIP lines. Some of the other providers gave users the ability to make this change themselves in the online management interface. Packet8 has to make this change for me.